Once again featured as a top-ten trend in the National Restaurant Association’s What’s Hot 2015 Culinary Forecast, healthful kid’s meals are here to stay. Healthy menus, considered an “umbrella trend,” are expected to continue to gain momentum in the next few years. 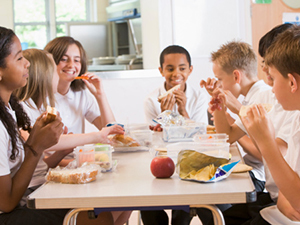 This trend isn’t news for school foodservice directors; operators have been revamping school nutrition since the Healthy, Hunger-Free Kids Act was passed in 2010. But for some schools, the new regulations have affected sales as well as nutrition. In fact, in 2013, 46% of school operators surveyed said that their lunch sales had decreased in the past two years, according to FSD’s annual The Big Picture research. Operators are turning to menu innovation to increase meal participation while serving foods that fit USDA guidelines at the same time. For some, serving alternative proteins, such as beans, at breakfast and at lunch has been a way to close that gap. According to 2013’s The Big Picture, 54% of operators said they serve vegetable or bean-based hot entrées at lunch, and 41% expect those menu items to continue to grow over the next year. What’s more, this year, 64% of operators reported serving ethnic entrées (which could include items such as egg-based sandwiches or Latin-inspired bean burritos) at breakfast. The versatility of bean-based entrées, along with their kid-approved taste, means these dishes can have a big payoff at all times of day. Thanks to several new products from Bush’s Best®, menuing these items is now easier than ever for operators. Bush’s Best® Taco Fiesta Black Beans. A fiesta for the senses, this black bean meal starter is as delicious as it is versatile. The dark, rich beans are immersed in a not-too-spicy sauce enhanced with a zesty mix of authentic Mexican seasonings, making them a natural pair for meat, seafood, vegetables or even other beans. Bush’s Best® Cajun Red Beans. Bayou flavor comes knocking in this red bean easy entrée. The liveliness of the Cajun-style sauce might sneak up on you, but the many possibilities are easy to see. The flavor and versatility of these beans means that they’re an easy, ideal fit for any menu application. Breakfast Bean Scramblers: Top grilled hash browns with fluffy scrambled eggs, Bush’s Best® Taco Fiesta Black Beans, and shredded cheddar cheese, giving breakfast a flavorful and fiber-packed boost. Cajun Frank and Beans: This dish pays tribute to the humble beginnings of Cajun cuisine, with simple ingredients, but big flavor. Sliced, cooked turkey hot dogs are mixed in with Bush’s Best® Cajun Red Beans, and served over sweet and savory corn bread. Baked Bean Quesadilla: Add Bush’s Best® Reduced Sodium Vegetarian Baked Beans to classic Mexican ingredients such as chopped tomatoes, fresh cilantro and diced jalapeños for a sweet, hearty take on this classic dish. For more information and to get additional kid-friendly menu ideas, visit www.kidslikebeans.com.